This guide provides an overview of the different User Role options that can be assigned to Checkbox users. For more information on how User Roles relate to permissions in Checkbox, see our User Permissions Guide or our User Roles Cheat Sheet. 1. 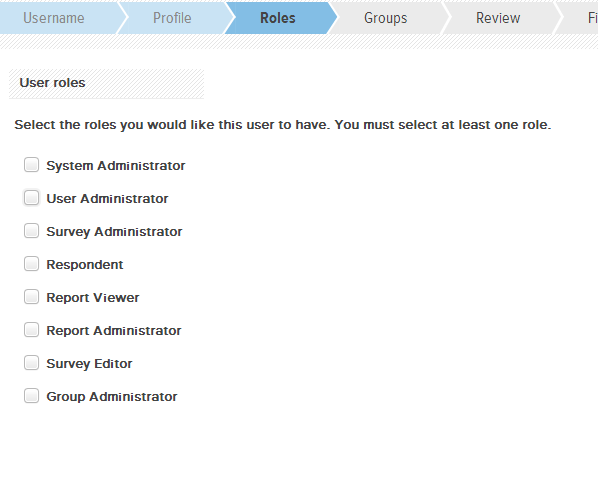 User Roles are assigned when a new user is created within the User Manager. Select +User to create a new Checkbox registered user. System Administrator: Super-user. Has access to all surveys, data, users, and system settings. User Administrator: Has the ability to create and modify new users. User Administrators can only modify users they have created. Survey Administrator: Has the ability to create, edit, and manage new surveys and reports. Survey Administrators can also create and modify Styles. Respondent: Has the ability to respond to surveys. Report Viewer: Has the ability to view existing reports (when granted access by the report creator or a System Administrator). Report Administrator: Has the ability to create and modify new reports. Survey Editor: Has the ability to modify existing surveys (when granted access by the survey’s creator or a System Administrator). Group Administrator: Has the ability to create new groups and assign users to groups. 1. To change the role of an existing user, select the user you wish to modify from the list of users on the left to expand that user’s dashboard. 2. Locate User Roles and select Edit. 3. 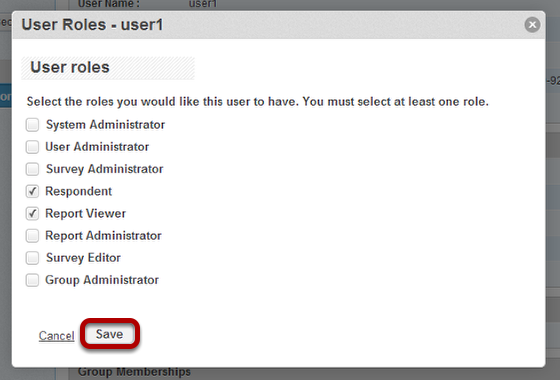 Select one or more user role(s) and save your changes. You should now see the user’s updated role(s) under User Roles.